The authors suggest banning the use of the words "Yuk" and "Do I Have to Eat This?" I couldn't agree more, and I would start by banning recipes like Salmon Asparagus Roulade, Shrimp and Fish Mornay, Tuna Souffles, and Asparagus Crepes from a kids cookbook. My kids, at least, DON'T love to eat this way. Not exactly what I was hoping to find. 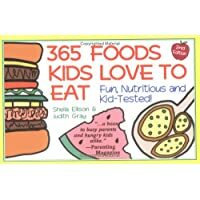 Want to learn more information about 365 Foods Kids Love to Eat : Nutritious and Kid-Tested? Copyright © 2011 Cooking Recipes Wow All rights reserved.